Our tropical themed bungalow is located in the center of Springfield. Not far from the Springfield/Branson Airport if you are flying in. We are minutes away from Historic Downtown, MSU, Cox and Mercy, Wonders of Wildlife, and plenty or Art Museums! Our place is cozy and private, so feel free to make this place your home for a nice relaxing getaway. There are plants and fountains placed throughout the home to give you that soothing feel of the tropics. Anyone and everyone is welcome in our place. The internet will be here on the 17th of august. Cozy living room with tropical feel. Coffee/Tea bar with natural local honey jar. There are two televisions, on in the living room, one in the master bedroom. This place was very comfortable. Had a good nights sleep. Very nice owners . We would definitely stay there again. The price was very becoming. This house is used for a VRBO and has limited furniture, however, I enjoy that because I feel less bad about infringing on someone's space. It had everything necessary that you would need. Very clean. The hosts had a candle burning when I arrived, as well as space heaters going in rooms that might be cold, however, I found that the heat was fine without the space heaters. However, I welcomed them during a shower (I love a space heater in my personal bathroom as well). The house is in a convenient area in Springfield, a town I used to reside in. Be sure to hit up Bambino's while there. 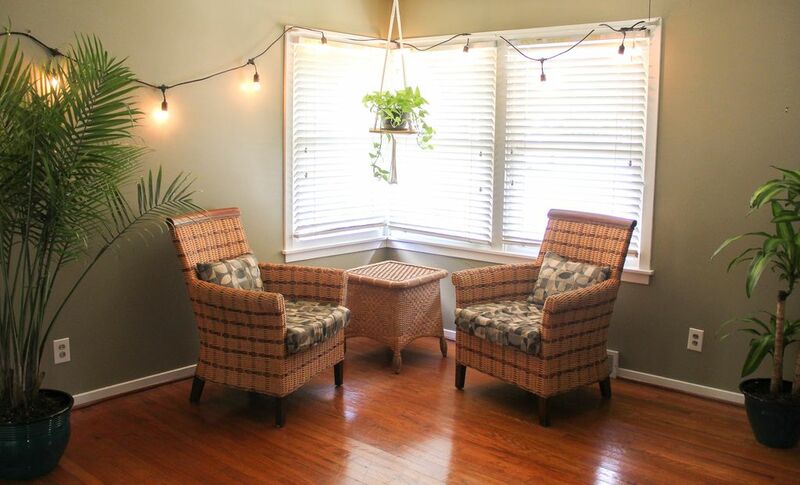 I would recommend this rental, however, if you have multiple guests, there are limited seating options in the living room without pulling in the wicker chairs shown in the pictures. The living room just has a small sofa. However, if you are planning to use it as a homebase and not planning to stay a lot, it is great! This house was very conveniently located for our visit with local relatives. It provided basic accommodation that was well presented and clean, though we found leftover opened food and milk in the fridge a little off putting. Laundry facilities, kitchen, bathroom and bedrooms were all in good working order and suited our needs well. Booking, check in and check out were seamlessly managed. The house was very clean and so cozy and comfortable. We really enjoyed the stay and we would definitely stay here again.